A one day workshop with pre-read at home. Suitable for Reiki people at Second Degree and above. 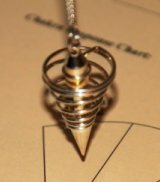 The pendulum is an excellent tool for anyone interested in self development or working intuitively with their clients. The pendulum is not a magical object that can give us the answer to all our questions. It is a precise method for communicating with our unconscious mind, the part of the mind that can perceive millions of bits of information that the conscious mind simply cannot. This information is where our intuition comes from, it is not myth or magic it is human nature. This course provides Reiki practitioners in-depth knowledge of the many uses for the pendulum, how to use the pendulum correctly to enhance your accuracy and develop your natural intuitive abilities. So if you’ve had that pendulum sitting in your drawer, now is the time to get it out and dust it off. If you haven’t been successful with your pendulum in the past the chances are you simply weren’t using it correctly. The pendulum teaches us how to communicate with the unconscious mind, how mindfulness and asking accurate questions is essential if you want to get accurate answers. The pendulum can do so much more than give you yes or no responses and this course will show you how. On the course you will also learn how to use the pendulum to detect imbalances in the person energy system, their chakras, the five elements, what Reiki frequency to use and much more. Which areas of the body need attention? What frequency of energy should be used?